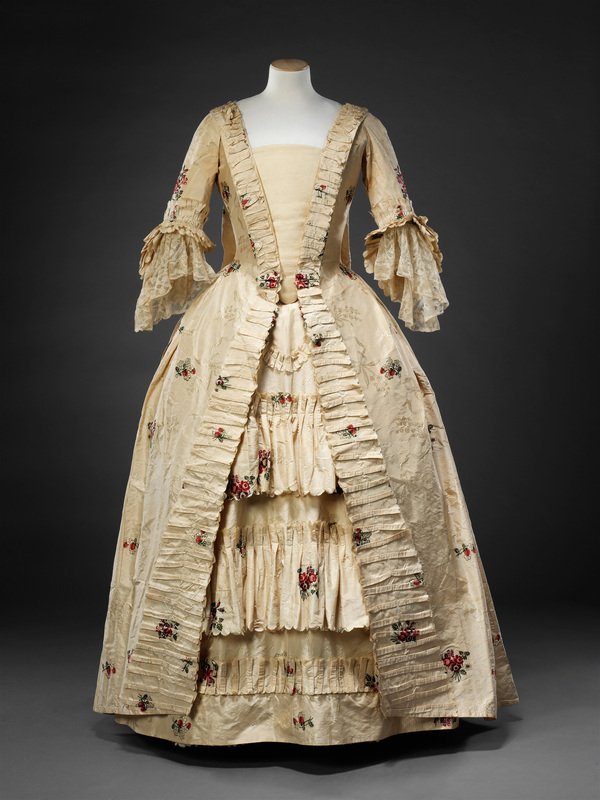 This two piece gown, comprising a dress with a loose pleated back and an open front revealing a matching petticoat, was known as a sack or robe à la française and was worn on formal occasions. 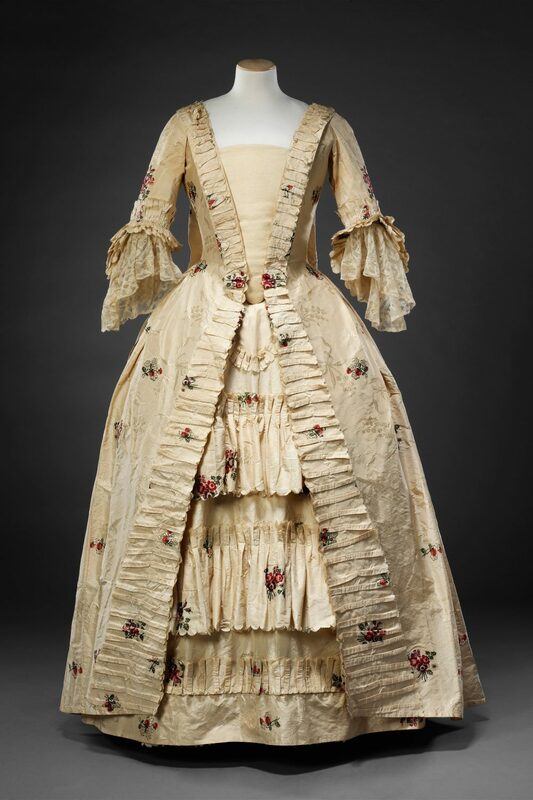 The presence of a covered button near the top of each side seam of the skirt on the upper side and a long loop of fine cord attached directly beneath indicates it would have been possible to wear the gown in a draped style imitating the fashionable French polonaise. The loop was drawn up to fasten on the button, pulling the fabric of the skirt up to form puffs on each side of the front and back. 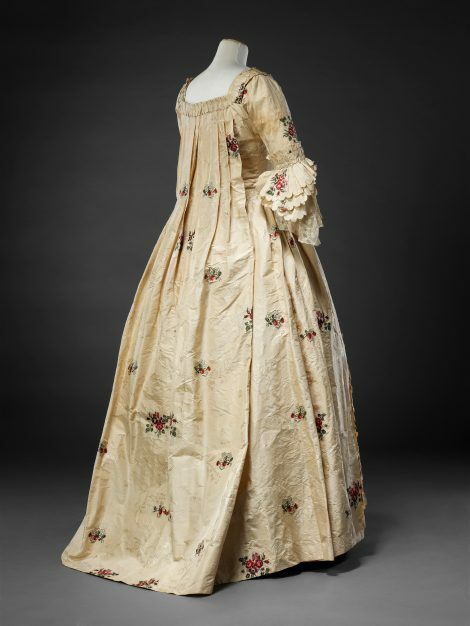 As is the case with many surviving 18th Century dresses, the gown has been made from an earlier silk, of around 1750. During the preceding years brocaded silks produced in the London area of Spitalfields had been famed for their naturalistic depictions of flowers and foliage (see Related Image), but by this time the sprays of coloured flowers and fruits, seen here, have become formulaic and less dominant compared to the lively self-coloured background pattern of foliage, ribbon and bows. The gown was acquired from the collection of a well-to-do West Country farming family whose surname was Jane. It is probable that it was kept within the family to be used as fancy dress in the 19th Century or early 20th Century. 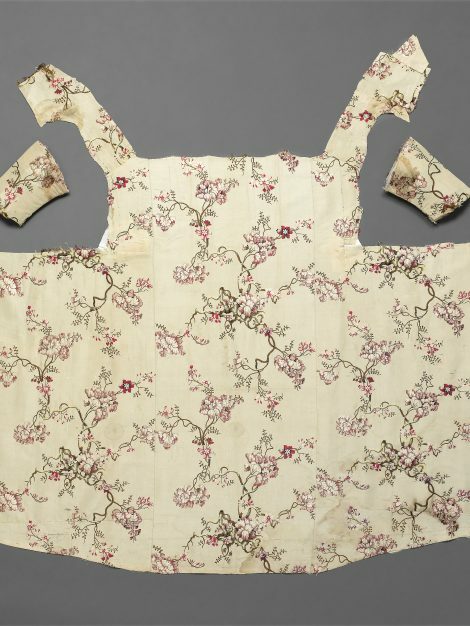 There are small additions to the interior of the bodice, including an inner waistband, and lace sleeve ruffles of a later date have been sewn to the base of the sleeves. 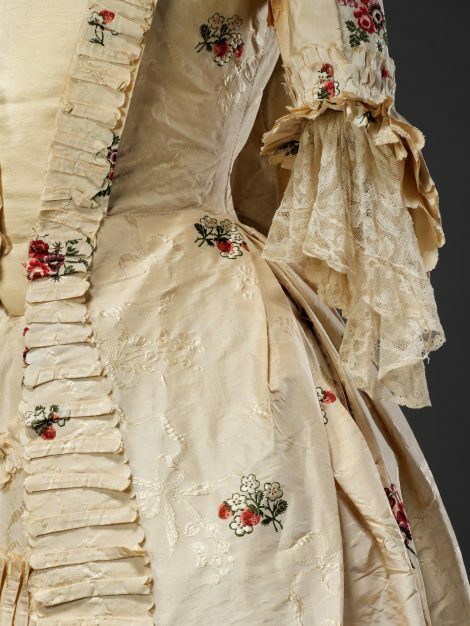 Owing to the high value of lace in the 18th Century sleeve ruffles would have been transferred from dress to dress rather than attached permanently.